When you make a necklace with one wire, it is often called a floating necklace. The clear tiger-tail can look invisible, so the beads look as though they are "floating" around the neck. Tiger-tail is a plastic coated wire that is very light and strong, and holds its shape very well. 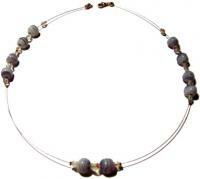 It is very effective when used to make a necklace, as it is easy to use and sits well on the neck. Thread one clam shell through the tiger tail, making sure that the loop is pointing up, and slide along to the middle of the tiger-tail. Thread one crimp through the tiger tail, and squash it. It should be right on the end of the tiger tail. Slide the clam shell back along the tiger-tail until it covers the squashed crimp, then close the clam shell around the crimp. You now have made one end of the necklace. then repeat five times. Do not squash any crimp at this stage, but there should be two crimps between each group - one for each of them. Thread the second clam shell onto the end of the tiger-tail, loop pointing up, and slide down the tiger-tail. Thread the last crimp onto the tiger-tail, and squash it right on the end of the tiger-tail. Slide the clam-shell back along the tiger-tail until it covers the squashed crimp, then close the clam-shell around the crimp. This will end the necklace, and hold all the beads on while you figure out the correct spacing. Hold both ends of the necklace together, and allow all the beads to weigh it down and find the center. 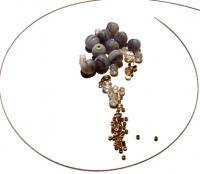 Hold the center bead group in place by squashing the crimps on either side so that they will sit in the exact center. Pick one side of the necklace, and slide the beads on that side along the necklace so that the two groups are evenly spaced from each other. About an inch and a half would be an ideal placement. Squash the crimps on each side of the bead groups on one side of the necklace when you think the spacing is even. Repeat steps nine and ten on the other side of the necklace. 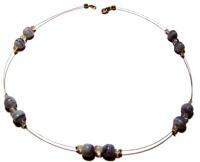 Check to make sure that the necklace is balanced, and that the five bead groups are evenly spaced. Push the hole of the parrot clasp through the loop of the clam-shell on one side and close the loop with the pliers. Put the smaller hole of the necklace catch through the loop of the clam-shell on the other end, and close the loop with the pliers. You have now successfully been able to make a necklace with one wire, and should now continue to make as many as possible! They are very attractive and can be made in an enormous amount of colors. Try experimenting with more or fewer groups of beads, or a different amount of beads in each group for a bit of variety. query: INSERT INTO accesslog (title, path, url, hostname, uid, timestamp) values('How to Make a One Wire Necklace', 'node/14', '', '3.84.182.112', 0, 1555951298) in /home/surelion/public_html/drupal-4.6/includes/database.mysql.inc on line 66.